Pierre Dinand is a living legend in the world of perfume packaging and design. His bottle creations are too numerous to list, but here are just a few examples: Givenchy Ysatis, Ivoire de Balmain, Tiffany, Coriandre, Caron Nocturnes, Lancome Magie Noire, and Yves Saint Laurent Rive Gauche. Those of you who drooled over the recent special edition bottle of Mûre et Musc for L'Artisan — that is his design. So was the lovely green fig bottle for Premier Figuier that was released last year. On his website, you can read a brief biography, learn about the technical aspects of bottle design, find a list of some of the perfume bottles he designed, and see his recent sculpture work. Your first perfume bottle was for Madame Rochas, which was released in 1960. You got involved with the project almost by accident. Can you tell us the story? Will a beautiful perfume in a beautiful bottle always sell, or does the bottle design have to be linked aesthetically to the actual fragrance in some way? I used to work closely with the perfumer, Guy Robert for Madame Rochas, Edmond Roudnitska for Eau Sauvage, Michel Hy for Calandre, Sieuzac For Opium, but it is different now, many perfumers compete and I don't know the fragrance at the start. But I spend time with the noses, and try to exchange our views on the project. It is always better that the bottle and juice are worked together. I love the bottle for Eau Sauvage. Can you tell me what aspects of the fragrance or the Christian Dior brand inspired the bottle, and how working with Edmond Roudnitska influenced the final design? Mr Roudnitska was quite a character, very stubborn and impressive, he would not accept any change on his fragrances propositions. You like it or not.... But we agreed on a working method, he would let me draw sketches and then we would go and meet with Christian Dior's Manager, Rene Bourdon, father of the famous perfumer Pierre. The box design, taken from the inside of a Rolls Royce, was more difficult than the bottle, printed with 7 colors to achieve this precious wood look. You created the statue now presented to winners of the Fifi awards. Tell us about the design, and how it relates the perfumer's art. I was asked by Annette Green and Fernando Aleu to propose a design to represent the Fragrance Foundation. I made a statue representing a man and a woman linked by a drop of parfum. Made out of crystal, the award has never changed since 1973. This was a gift from me to the Fifi organization. You have created around 500 perfume bottles, so I am sure it is hard to pick favorites, but can you name a few that you think were especially innovative or special to you? Of course, I have favorites: Yves Saint Laurent Opium, Paco Rabanne Calandre & Pour Homme, Calvin Klein Eternity & Obsession, Givenchy Amarige, Christian Dior Eau Sauvage, Azzaro, Estee Lauder Pleasures, Burberry for women, and the latest Paul Smith London with InterParfums. And can you name a few of your favorites by other bottle designers? Of the others I didn't design, Chanel no. 5 is my favorite for its timeless class, or L'Air Du Temps for its baroque allure. Recently I have not found anything interesting and really new. People are copying each other, without creativity. In this day and age, you would think that fragrance packaging would be more important than ever. To what do you attribute the decline in creativity in bottle design? Is it the increasingly rapid pace of fragrance releases, or something else? Creativity is less important nowadays, now that marketing studies end up with the exact same recommendations, whatever the company. The result is levelling the design to the base, cutting everything too low like cutting grass in your garden, then the little flower blooming in the middle has no chance to survive thanks to the powerful P&G Marketing Gurus, invading the world of parfumerie. C'est la vie, or I should rather say c'est la mort. It is the death of creativity. That explains the shorter life of these products who are often dead in the egg. I must say that my work with Calvin Klein and Robin Burns [of Estee Lauder] was very unique and rewarding, because they wanted something new, not following trends but ahead of them. Same philosophy at the PUIG Group in Barcelona for Paco Rabanne, and Pierre Berge & Yves Saint Laurent for Opium. I love both of his bottles for l'Artisan and I just wish I liked the scents more so I could buy them. They're near misses, both. Nice interview, Ms NST. Fantastic interview. Thanks for posting the link to his site. That's an astonishingly long list of bottles that scrolls across the bottom of the home page. I absolutely loved the original Armani bottle and the Calandre and Nocturnes bottles. Am now starting to think maybe I should invest in those two L'Artisans despite not being obsessed w/ their scents. Very fortunate he didn't have a driver's license. Thanks! It really is a truly astonishing body of work for one man to have created. Great interview! I think that there are some designers whose bottles I nearly always end up liking, and Mr. Dinand's are, without fail, among them. I absolutely adore Opium bottle and Eau Sauvage bottle. What striking is the ability to go from one creative sensibility to another, producing a beautiful result all the while. Thank you, R! How wonderful. Noses get the recognition they deserve, these days, so should bottle designers. Many thanks to M. Dinand for creating the Madame Rochas bottle. My mum had the fragrance when I was little, and it was my first introduction to the world of beautiful scents and bottles. It was elegant and “French” to me. Still is. What a talented designer and a fab interview. Thanks R – this was really interesting. I adore the L'Artisan LE bottles. Wish they would give them out for free (we can all wish!) or sell them sans juice as I am not too keen on either of the perfumes. Wonderful interview! It's good to know who created all those beautiful bottles. OT: I wanted to thank you for recommending Hiris to me. I got a bottle very cheaply–and I'm really enjoying it! V, The Opium bottle was really amazing, in fact, it is easy to forget now how innovative it was at the time, just as it is easy to forget how innovative the juice was, now that it has been around for so long. M, I agree wholeheartedly, although have to at least partially agree with M. Dinand — it is rare that I look at a modern bottle and am struck by its creativity. I wouldn't say never, but it's rare. Thank you N, and LOL at “give them out for free” — that'll be the day!! J, I am so glad you got a deal on Hiris and you love it!! It is such a great fragrance. I agree with parislondres: I would love to buy some of his bottles without the juice to add to my small perfume bottle collection. 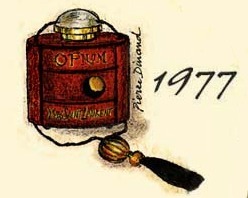 Of M. Dinand's bottles, the opium and l'air du temps ones are my favorites. They seem to capture the very essence of both of those wonderful fragrances. Hi R! Small correction: the L'Air du Temps is not his bottle, he was just saying that he admired it, along with Chanel no. 5. R, thank you for this intersting interview! I love beautiful perfume bottles & think it must be wonderful to be so talented to create them. A classic designed bottle that I admire very much is the perfume version of Chanel No. 5 & the other Chanel perfumes. Thoses bottles are really stunning! I must be growing cross-eyed in my old age, R! LOL! Well, if he didn't create the L'Air du Temps bottle (guess that would make him quite old, huh?? ), then I take it back! LOL! But seriously, I would love to have one of those L'Artisan bottles! Now see, to me, the Montale bottles are not pretty, but they are striking, and I do appreciate the fact that they are protecting the fragrance — which is, after all, not cheap! But agree, I cannot afford the pretty LEs! I really appreciate your interviewing Mr. Dinand. I had no idea about the difficulties of the Eau du Sauvage bottle and burled wood box design. When something is so commonplace, one takes it for granted, so it's always interesting to read the crazy stories about their conception. I love his design for Bal a Versailles. It is so Versailles and 60s at the same time. Also, his bottle for Vicky Tiel is great. He is facility at doing both mod and rococo bottles is pretty amazing. Agree — I tend to take the packaging for granted, especially since I meet so many perfumes for the first time in a little sample vial. Off to look up the Vicky Tiel bottle! What a talented man! Great interview. I had no idea he designed the Vicky Tiel bottles. They are truly gorgeous – I've never smelled the juice, but would love to have one of the bottles on my dresser. I'd also love to have both of those wonderful ltd edition bottles from L'Artisan. One of my favorite designs of his is the bottle for Pleasures by Estee Lauder. I clearly remember it was the clean elegant design that first captured my interest. Pleasures is a wonderful bottle, and so is the Vicky Tiel, which I just discovered. I have never smelled it either and will have to look for it! I love his design for the Magie Noire bottles (the round ones that used to be sold.) I think it was just really well conceived and executed. But really, so many of his bottles are admirable, you're right. Agree, K, the Magie Noire bottle is lovely, as are so many of his designs. Wow, what an interview. Thanks for this, Robin. My personal favorite bottles by the great Pierre Dinand are Calandre (I *think* it's the same as Eau de Metal which I loved–looks like the UN building–sorry if I'm wrong) and Ysatis. I also love the Fifi award statue he designed, but the Calandre bottle is one of my very favorite bottles of all time. Btw, I have photos of my Metal bottles in my gallery on MUA–that's how much I love those bottles which are so streamline and perfect, my idea of visual glass art bliss, and I really love glass–it's half the reason I love perfume, maybe more. Oh, yes, I love those Vicky Tiel bottles. I have Sirene EDT, the 5 ladies…and I don't have it but I love the parfum bottle, too, with one lady and a long applicator cap. S, I will have to go look at those pictures. I didn't know you were such a huge bottle fan. He has made so many that even his own website does not list them all, so chances are that you have a bottle of his even if you don't know it! Pierre Dinand has created some very iconic perfume bottles and will be eternally remembered for his brilliance in design. I absolutely adore his work on OPIUM, Eau Sauvage, Ivoire, etc. I strongly believe that a good bottle and packaging can seriously affect the sales and popularity of any fragrance and Monsieur Dinand is a living legend for creating such icons in perfume presentation! I just saw a mention on osmoz.com that they changed the bottle for Opium. We all know what that means: reformulation! (although i certainly hope not – it is such a gorgeous fragrance!) Apparently monsieur Dinand is none too happy, either, and who can blame him!! I saw that too. Shame, it was a really wonderful bottle.